John Allan McKay was the son of John G. A. and Mary (nee Hilsdon) McKay who farmed at Lot 14, Concession 7, West Zorra Township. 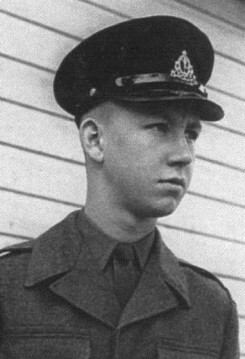 John enlisted right after turning 17. Due to his age he still required his parent's permission to do so. He trained at Wolseley Barracks in London, Ontario, and was assigned to the Royal Canadian Corps of Signals at Barriefield, Ontario. He was later stationed at Camp Petawawa, New Brunswick and then Headquarters Winnipeg. Later he was stationed at Camp Shilo, Manitoba. When at Camp Shilo he was "brought up on orders" which meant that he was ordered to stay in the Tele-communications Centre one night and answer the "red phone" if it were to ring. If the phone were to ring with any emergency message he was to wake the Lieutenant and he would enact the "chain of command". This was at the time when President Kennedy had the blockade around Cuba. At this time Kennedy and Kruschev were in communication trying to settle this blockade. John was honorably retired under the provisions of QR (Army) Article 15.01 Item 4(c) on February 24, 1965. He returned to the Embro area and later moved to Niagara on the Penninsula. He married Marilyn Shinkel on July 31, 1965 in Winnipeg. They then made their home in Niagara. Here they raised a son, Scott, and a daughter, Shelly. John and Marilyn moved to Woodstock in 1972 and currently make their home there..